Financial independence and minimalist living go hand in hand. They are very much related in my opinion. The road to financial independence almost always involves adopting somewhat of a minimalist mindset. I am not saying you need to give up your home, cars, or personal belongings altogether – but you do need to think like a minimalist. That may mean dropping your cable for cheaper streaming options. Or maybe selling your car that you no longer need when you decide to start working from home. Having minimalist habits means you have less stuff. Owning less “stuff” should put more of your income back in you pocket. More income = more money to invest, which will ultimately increase your net worth. For example, over the past couple of years, our family has focused on building our net worth. We have been investing more while at the same time paying down our long term debts. The Result – In just 2 years, we have grown our net worth by over $100,000! This would have been impossible if we didn’t adopt minimalist habits along the way. Here are 5 minimalist habits that our family has recently made. No … we are not selling our house and moving into an RV! I am not sure our family would survive together in such a small area long term. We are not going off the grid and making drastic changes to our lifestyle. Instead, we are making small, subtle changes to how we live that follow a minimalist mindset. Nothing drastic by any means, but rather a mindset change to always consider what we want to afford. We still want to enjoy life to the fullest and are okay with spending money now on things (and experiences) that are valuable to us. But we also don’t want to waste money and feel that adopting minimalist habits will help us “challenge our expenses”. Like I said earlier … you must adopt minimalist habits in order to become financially independent. Here is a quick list of our minimalist lifestyle changes we have started making over the past month. For the past couple of weeks, we have been working on cleaning up our budget. It only took a couple minutes to realize we have wasted over $1,000 already this year on mistakes. From late mortgage and HOA payments to costly memberships we never used – the wasted money has quickly added up. We are not going to let that happen next year. So we have been cleaning up our budget and making saving a priority. A clean and healthy budget must be a priority for a minimalist lifestyle. If you need help tracking your monthly spending, I highly recommend checking out Personal Capital and setting up a free account. It is the best tool available to help track your net worth and can even help with your spending. Okay … you may be saying – What? Spending more on food is not a minimalist activity! Despite spending a lot more on food (like $500 more a month), we are cleaning up our poor eating habits. No more processed foods that really aren’t even foods. No more ingredients we can’t pronounce. Instead, we are eating whole foods like fruits, vegetables, healthy fats, meats, and nuts. These foods cost more for sure. But these foods are also minimally processed and are the best fuel for our bodies. And because we are eating healthier, we are preparing our meals at home. That means less waste from not eating at restaurants. I even started throwing our vegetable and fruit scraps in a compost pile in the backyard instead of in the trash. Eating healthy, unprocessed foods is definitely a minimalist trait – despite the higher costs. I would even argue that by eating healthier long term – you will ultimately save on medical costs in the future. Yes … earlier in the year we decided that the cost of cable was no longer worth the service. We didn’t want to give up television completely, so we opted for much cheaper streaming services like Netflix, Hulu, and Sling. Well, recently we realized that Sling was no longer worth the money. So starting next month, that will be on the chopping block too. Cutting this service will save us another $21+ a month or $250+ annually. After signing up for Sling earlier this year, we have realized it is too much money for the return we are getting. I think it is important to periodically review the services and memberships you are spending your money on. That way you can cut out anything you no longer use. We don’t have a lot of storage in our home. No basement and a small attic has actually helped us reduce clutter over the years. But that doesn’t say we don’t have clutter and items we never use laying around the house. So recently, my wife and I have been going room to room giving away things we don’t need to charity. If we feel something has a lot of monetary value, then we will try and sell it on Amazon FBA or eBay. Otherwise, it has gone to charity. One of worst rooms in our house has always been our home office. It has always been a landing spot for stuff we don’t use that often. After we went through this room and got rid of the clutter – it is peaceful. I feel like I can get stuff done in there now. A lot less distractions lets me focus on building side income. Say what? How can owning a cell phone be part of a minimalist lifestyle? Like I said before, you don’t necessarily have to give up everything in your life to adopt a minimalist mindset. If owning a cell phone, car, or home is important to you … then great. But owning a cell phone can cause a bunch of distractions. Social media, emails, other time wasting apps can clutter up your day. So last week I decided to remove the clutter from my phone by deleting a bunch of apps. Most of these apps I hardly ever used and wasn’t sure why I had them. A few others that I frequently use I decided I could still live without. It sounds crazy, but I can already tell a difference. There is less clutter for me to get distracted now on my phone. So if I now go and check an email, I don’t get bombarded and distracted with colorful looking apps that serve no purpose in my life. I would like to point out that I kept apps that are important to me – like the Robinhood brokerage account. The Robinhood app is the only method you can use to buy and sell stock through your account. 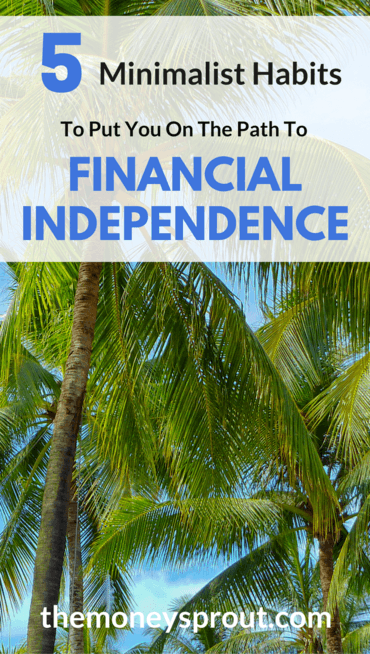 Do you want to reach financial independence? If you do … then you will need to start living well below your means. And in order to live this type of lifestyle, it will take a minimalist mindset. Our family recently started adopting a few changes that follow this minimalist thinking. Cutting our cable and fixing our budget will immediately keep more income in our pocket. Other changes we are making are not as immediate like eating healthier and eliminating physical and electronic clutter. But each of these will help us stay focused and save time. 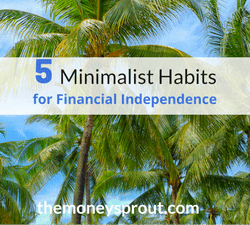 What minimalist activities have you adopted to help you reach financial independence?